After visiting the Paravur synagogue, I started walking back to the boat Jetty, which is hardly 300 meters from the synagogue. The tickets for the Hop-on Hop-off boat service has to be obtained from the tourism office in the Paravur synagogue premises. As I walked through the narrow bylines of North Paravur, I couldn't help but wonder the enormous historical events took place at this sleepy island villages. While walking towards the Jetty one thing strikes instantly - the street is spotlessly clean. Unfortunately in India, it is a rare sight. The crew of the Muziris heritage tour was waiting for us and soon the boat started sailing gently over the small canals flowing towards the Periyar river. The boat driver was a jovial fellow. He steered the boat and engaged us in conversations - the tidbits that only a local knows. As we proceeded towards the next destination - The Pallippuram fort- our friendly driver showed us the special enclosures where the prawns are cultivated, the iconic "cheena valas"- a specific type of fishing nets and the boats under construction. We were striking quite a conversation about the region and in no time the boat was near the Manjumatha church jetty. 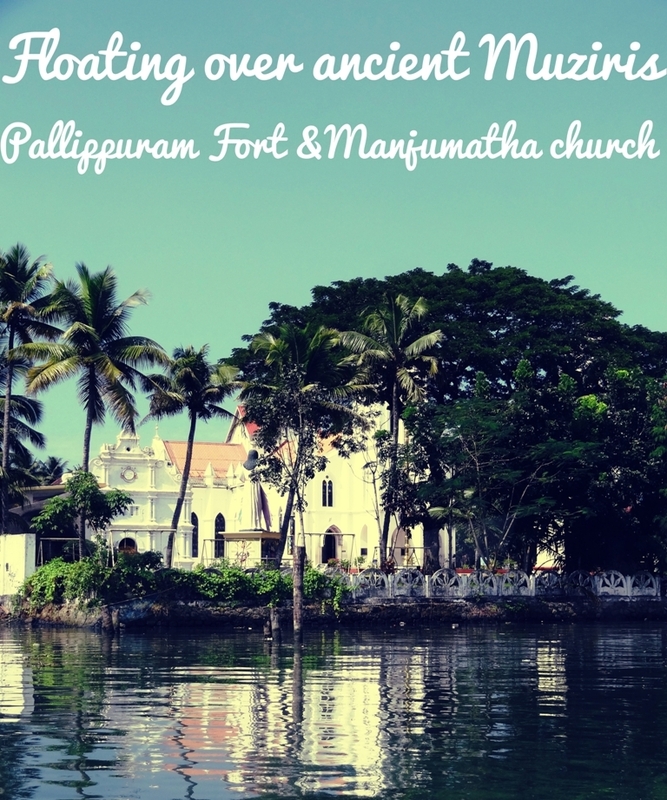 A walk of half kilometer from Manjumatha church would lead us to the first ever European monument in India - The Pallippuram Fort. As I stood before the information board at the Pallippuram Fort, I was wondering how many travelers would appreciate it's immense historical value. The fort looks quite simple and dilapidated. It has nothing to boast about visually. However once you learn about the dramatic incidents took place here during the European invasion of India, it is hard to ignore this humble fort. It is the oldest surviving European construction in India. Portuguese, soon after landing in Kerala on 1498, received the permission to build an outpost at the Northern extreme of Vypeen Island- a place named Pallipuram. This hexagonal shaped out post was built so that the entrance to the back waters from the North can be controlled. This military post is also referred to as a "fort" in the official records. The Pallippuram Fort was constructed in 1503 ( and some sources say 1507) . It was a major watch tower and was garrisoned by 20 armed men. Each of the facet of the Pallipuram fort was pierced to hold a cannon. sent his first minister Kesava Pillai to strike a deal with the Dutch to purchase the Pallippuram Fort. In a transaction amounted 300,000 Surat Rupees, Dutch sold the Pallippuram and Kodungallur forts to Tranvencore(3). Tipu did attack the Pallipuram fort but was defeated and was almost killed. Hence from there on, the Pallippuram Fort remained with the rulers of Travencore, who renovated and conserved it as a historic relic in 1909. As I stood inside that deserted fort, which was once engaged by armed men and war. I was wondering how many soldiers would fell at the same place that I stand now. How many would have died and how many would have lost their dearest dreams fighting as just pawns for the political and trade agenda of their leaders. We walked our way back to the Manjumatha(Our Lady of Snow) boat Jetty. We had a quick stop at the Manjumatha church compound. It was built by the Portuguese around the same time as they built the Pallippuram fort. The Portuguese dedicated this church to Our Lady. The legend says that during the invasion of Tippu Sultan in 1789, the church premises was covered in snow and Tippu couldn't proceed with his assault. After this the church was renamed to Basilica of Our Lady of Snow. In 2007, Manjumatha church celebrated it's 500th birthday. The old church has a Dutch cemetery attached to it. The ancient church is not used for adoration, it is under the archaeology department now. It was around noon and was getting hotter. I felt very comfortable going back into the air conditioned boat. As the Muziris tour is in its beginning days, there is not much of a crowd in the boat. We started our journey towards the Kottappuram fort. As the boat gently moved over the waters of the Periyar river's tributaries, we got a glimpse of the ancient "Kanyan Thomman" church which is believed to be one of the seven(and half) churches that was founded by St. Thomas, the disciple of Jesus who arrived in India in AD 52. Our driver showed some queer scenes from the banks of the river, like the below boat, which had been toppled down while it was being chased by coastal police. According to our driver, that boat was trying to smuggle silver! As we move through the river, we can see the workshops for boats and even big ships. After completing the construction, they would directly be pushed into the river for a test drive. However, I think the below boat was not so fortunate to touch water in it's first attempt, as it toppled down while being pushed in to the water. Poor guy!